Hire Too Hot Tamales - Mary Sue And Susan to Speak at Events - Professional Speaker Booking Agency. Mary Sue Milliken and Susan Feniger, two of America's most beloved chefs, are hands-on owner-operators of the popular and critically acclaimed Border Grill restaurants in Santa Monica and Las Vegas, serving upscale, modern Mexican food in a hip, urban cantina setting. Mary Sue Milliken and Susan Feniger also own and operate Ciudad restaurant in downtown Los Angeles, featuring the bold, seductive flavors of the Latin world. 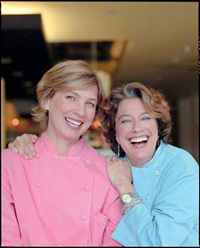 Mary Sue Milliken and Susan Feniger, are authors of five cookbooks, including Cooking with Too Hot Tamales, Mesa Mexicana, and City Cuisine. Mary Sue Milliken and Susan Feniger, are television veterans, starring in almost 400 episodes of Food Networks popular Too Hot Tamales and Tamales World Tour series. Mary Sue Milliken and Susan Feniger, are active members of the community, playing leading roles in many charities, notably Share Our Strength and the Scleroderma Research Foundation.. Learn how to hire Too Hot Tamales - Mary Sue And Susan or research availability and pricing for booking Too Hot Tamales - Mary Sue And Susan to speak at a corporate event, fundraiser, private party, social media campaign, fair or festival, tradeshow or conference, endorsement project, or hire Too Hot Tamales - Mary Sue And Susan as a guest speaker, please submit the form to our agency. Frequently Asked Questions about booking Too Hot Tamales - Mary Sue And Susan. Is Too Hot Tamales - Mary Sue And Susan available to work my event? Too Hot Tamales - Mary Sue And Susan's current work schedule and location in relation to your event's type, date, budget, and locality will play a primary factor in the acceptance of booking Too Hot Tamales - Mary Sue And Susan for your party. As long as your funding is commensurate to the price range to book Too Hot Tamales - Mary Sue And Susan, CTI will propose your event to the official agency representing Too Hot Tamales - Mary Sue And Susan. After we consult with them, we can circle back with you to provide a personal and accurate quote that includes: final costs, availability, and actual interest in being hired for your specific event or party. How much is Too Hot Tamales - Mary Sue And Susan charging for events? CTI can give you the Too Hot Tamales - Mary Sue And Susan booking price once we submit your event details to their camp. "How much does it cost to book Too Hot Tamales - Mary Sue And Susan for an event?" is a frequent question we get, but the final Too Hot Tamales - Mary Sue And Susan booking price is contingent on many variables and the booking fee we show is based on a range derived from our past experience with what will Too Hot Tamales - Mary Sue And Susan charge for an event. Also, thier speaking fee might be different than the fee shown for the cost to perform or to just appear. Popularity, career stage, along with current demand will cause fluctuations in their speaking price too. The final booking price may be more than what is shown, but you should at least have a budget within that range for them to consider an appearance, performance or speaking engagement. How do I contact the Too Hot Tamales - Mary Sue And Susan agent or manager? CTI negotiates on behalf of professional event planners and talent buyers for paid appearances! We cannot give out direct contact information of the Too Hot Tamales - Mary Sue And Susan agent or help distribute fan mail, personal messages, gifts, requests for free appearances, or donations of time. The Too Hot Tamales - Mary Sue And Susan manager and agent will only work with us if we present them with funded offers for their client to work your event. Can I book Too Hot Tamales - Mary Sue And Susan for an event at a price less than shown? There is low probability to book Too Hot Tamales - Mary Sue And Susan for a party with anything substantially less than the published booking cost price range. We will negotiate with the Too Hot Tamales - Mary Sue And Susan agent on your behalf, but if your funding is not in place then it will more difficult to book Too Hot Tamales - Mary Sue And Susan, because they get many offers to work events that are at or above asking price. It is also important to consider the travel costs when researching the Too Hot Tamales - Mary Sue And Susan booking fee, as additional expenses like this, as well as an entourage of staff and equipment, are not necessarily built-in to the booking fee range shown. If your budget does not factor that in, then there is no benefit for them to want to be hired. We do not personally speak for Too Hot Tamales - Mary Sue And Susan, but in our experience in booking talent for over 25 years, this is generally the outcome of inadequate funding. CALL US TODAY (760) 729-2000 and speak with a CTI Too Hot Tamales - Mary Sue And Susan booking agent to get direct availability and pricing for having this talent to work your event. Contact us at (760) 729-2000 for complete details and information for the Too Hot Tamales - Mary Sue And Susan speaking fee to appear as a guest speaker at a corporate event or other business speaking engagements like lectures, retreats and business summits. With almost 30 years of industry experience working with professional event coordinators and buyers like you, we can successfully work to hire Too Hot Tamales - Mary Sue And Susan to speak as a keynote speaker at conferences and tradeshows, or as a spokesperson for branding and promotional marketing, product or service launches, business projects, print advertising campaigns, media events, fundraisers, and even social marketing campaigns and guest appearances on TV/Movie specials including documentaries or infomercials. CTI will directly contact the Too Hot Tamales - Mary Sue And Susan agent, representative, or manager to present them with your event while inquiring about current availability and interest. If they want to work your event, then we begin pricing negotiations - on your behalf – to secure the lowest possible Too Hot Tamales - Mary Sue And Susan booking fee they will accept. Let CTI be your speaker booking agency for Too Hot Tamales - Mary Sue And Susan to hire them to give a speech at conventions, college and university commencements, trade shows, or charity events. The Too Hot Tamales - Mary Sue And Susan booking price may dramatically change based on the location of spokesperson campaigns, speeches, concerts, or as a voice over on video games and television and radio commercials when considering domestic or international travel. CTI agency will help book Too Hot Tamales - Mary Sue And Susan as a speaker if the buyer has the budget and if they are interested in the event. CTI can assist on the production needs for Too Hot Tamales - Mary Sue And Susan when needed.